This article explains you all about the configuration files of ansible and management of ansible configuration files. Before playing with Ansible automation, We should have knowledge about ansible configuration files where it is located, what is the purpose of it. 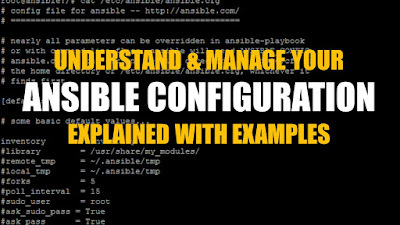 Also Watch this "ANSIBLE CONFIGURATION MANAGEMENT" Tutorial video free on our YouTube Channel. This ansible configuration file has many parameters like inventory file location, library location, modules and etc,. All these default values are commented. If you wanted to change the default behavior of any parameter, just uncomment and change the value. Before making any changes in the config file, Run a ansible ad-hoc command to get the uptime of the clients. We have got the uptime output of hosts only for node2 which was mentioned in the default inventory file ie /etc/ansible/hosts. Lets do a change in ansible.cfg file to find the inventory file in other location rather than the default inventory file /etc/ansible/hosts. Where we have specified two clients node1 and node2..
Uncomment the inventory paratmer as below and save the file. Rerun the ansible-ad hoc command again. This time We have got the uptime for two nodes (node1 and node2) which means ansible has used the inventory file /root/myhosts. Default configuration of ansible is more sufficient for us. But On some cases, we may needed to change the configuration file to suit for our need. And also you have different options to use these parameter as an argument to override these config file values while running the ansible command directly. Lets bypass the argument to use the different inventory file /root/databasehosts rather than changing the configuration file. The above output shows uptime of three hosts mentioned in the new inventory hosts file /root/databasehosts using "-i" option to specify the inventory hosts to not use the ansible.cfg configuration file. similarly you can use other options to pypass the argument of any parameters. Ansible has the flexibility to have multiple configuration file. So changing the single configuration file for every time is not required depend on the environment. Ansible will find the configuration file as below whichever it finds first. 2. Find ansible.cfg in the current working directory if Environment variable ANSIBLE_CONFIG not set. Hence you can create dedicated directory for different environments. 3. Find ansible.cfg in the home directory if Environment variable ANSIBLE_CONFIG not set and no ansible.cfg file in the current working directory. Why do we use multiple Ansible configuration file? For example, we may have database servers, application servers, web servers separately. Each will have different users, different host inventory file. So when you perform some automation using ansible only for database hosted servers, you may change the ansible.cfg accordingly. Again if you want to do some automation on application server, again you would change the same config file. This is quite challenging and confusing one. Hence we have the ansible configuration flexibility. How do we find which ansible configuration file has been used? Use -v option along with ansible command. That's all about the basics of Ansible Configuration Management. Going forward, we will play more with ansible tool with some test cases.